BINSTED Primary School’s Big Build Project has been given a special boost with the quiet support of the Ahmadiyya Muslim community who host the annual Jalsa Salana event at neighbouring East Worldham.The primary school has launched a £113,000 Big Build Project appeal to finance the building of an additional classroom. Providing primary education for four to 11 year olds living in Binsted, Kingsley, Oakhanger and the surrounding villages, due to rising numbers and the introduction of a new National Curriculum in 2015, the year groups have been re-organised into reception year, years one and two, years three and four, and years five and six.However, the school has only three dedicated classrooms which has meant leaving two year groups, one class, without a classroom. The children in years three and four (seven to eight years old) are now permanently taught in the school hall. To meet the current demands of the national curriculum and to continue providing high-quality education and adequate sports facilities, the school desperately needs to build an additional classroom during the summer holidays.One of the key fundraising events is ‘Fest in the Field’, which takes place on Saturday, June 11, at Country Market in neighbouring Kingsley.Fest In the Field will offer live music by artists such as pop icon Lemar, Joe Waller (of X-Factor fame), and groups such as Ellamentl, as well as children’s activities, locally-produced food and a licensed bar – not forgetting the quintessential tea tent celebrating the Queen’s 90th state birthday. 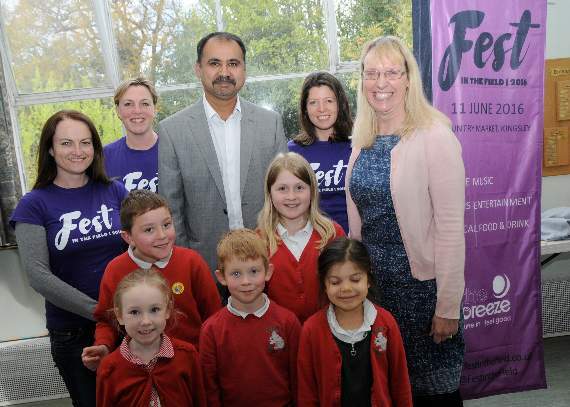 In addition, children from seven primary schools will compete in the Fest In The Field inter-school choir competition with East Hampshire MP Damian Hinds presenting the trophy to the winners. Sponsorship is key to the success of the event, and while many businesses and members of the community are already on board, the organisers have welcomed the practical support offered by the Jalsa Salana.Fest in the Field organiser Lucy Ambache said: “The Jalsa Salana team have not only given us much-needed direction on how to manage the event, they have generously given us the printed posters and leaflets you are seeing locally. Share the post "Muslims lend school a helping hand"